How Can I Find Public Records Online? available online - who has them and what is available for "free or fee" - without spending time searching endless sources? How can someone determine which records are available online - who has them and what is available for "free or fee" - without spending time searching endless sources? 60 page "Public Record Primer." Informative and descriptive text educates researchers on the complexities of public record research. 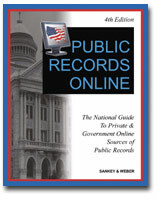 Detailed profiles on public record websites for all 50 states including County, State and Federal government agencies. A directory of recommended government sites. Indexes and profiles of private companies who distribute public records. Michael L. Sankey, Peter Weber and James R Flowers Jr., editors of Public Records Online, call on their extensive experience in the information retrieval and publishing industry. They have produced Find It Online, Online Competitive Intelligence, The Sourcebook to Public Record Information among other titles dedicated to the searching and understanding of public records. Facts on Demand Press is an Imprint of BRB Publications, Inc., the recipient of the 2000 Publisher of the Year award from Quality Books. YOU SAVE $14.00 OVER INDIVIDUAL PRICING! 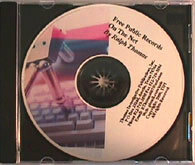 Copyright: 2001, Thomas Investigative Publications, Inc.